Not being able to finish a tank due to weather or any other reason happens to just about everyone. Is it OK to simply leave the sprayer as is, and resume spraying later after some agitation? In many cases, the answer is yes. 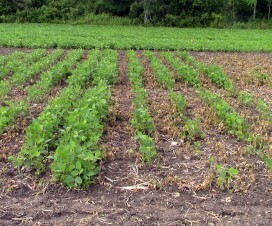 Most pesticide mixtures are stable in short term storage. On resuming spraying, an agitation could be all that’s needed to get back to where you started a day or so earlier. But there are three important exceptions. When the active ingredient is formulated as a suspension. Suspensions are typically wettable powders and flowables, and rely on a clay carrier to distribute the active in the tank. Because clay is denser than water, these formulations settle out quickly after agitation stops. Sure, they can be brought back into suspension with vigorous agitation. But in lines and booms, boom ends and screens, dislodging a settled clay carrier is much more difficult. It’s also hard to tell if the cleaning has been successful because the problem spots are hidden. The best solution is to flush the spray boom with water before materials can settle and lodge. A visual inspection where access is possible, such as strainer bowls and boom ends, is part of the process to ensure the formulated product has been removed. Learn to identify which formulations are suspensions. There’s lots of jargon out there. Look for terms such as DC, DF, DG, DS, F, Gr, SP. Even EC formulations are suspensions (oil in water) and require agitation. When the active ingredient is chemically unstable. Some pesticides can degrade in the tank, usually due to alkaline (high pH) hydrolysis. The effect is very pesticide specific, but in general, insecticides (particularly organophosphates and carbamates) are more susceptible than other pesticides. This fact sheet by Michigan State University describes the impact of pH on a the half-life of a large number of pesticides. Note that in the examples in the MSU fact sheets, pesticide half lives are typically days and weeks, and only rarely hours. Also note that while high pH is most often problematic, low pH can lead to faster breakdown in a small number of products. Ensuring tank mix stability requires a pH meter or paper, and possibly a pH modifier such as citric acid. But do your research first! Here’s an article on pH and water quality. When the tank previously contained a product known to harm the current crop. This situation is most common and most difficult to address. Some examples from western Canada are Group 2 modes of action sprayed prior to a canola crop. Why are Group 2 products implicated? Many are formulated as dry products on a clay base, and these can settle in boom ends, adhere to tank walls, or get stuck on screens. Their solubility is pH dependent, as we explain in this article. Canola is particularly sensitive to this mode of action, and the most common canola herbicides, Liberty and glyphosate, are formulated with strong detergents that act as tank cleaners. Even when applicators think that their tank is clean, they can’t actually be sure and can’t do much about it at that stage. The stripping of tiny amounts of residue off the tank walls, filter screens, or plumbing, can happen during a mid-day stop or an overnight break. Applicators eventually find out that this happened, usually about two weeks after spraying. After spraying a herbicide to which a subsequent crop may be sensitive, with the classic case being a Group 2 and moving to canola, be extra diligent with cleaning and pay attention to the tank walls, all screens, and boom ends. The best way to solve issues is to avoid them in the first place. 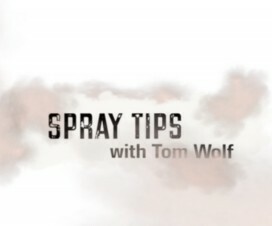 If the weather looks unsettled and may interrupt your spray operation, consider mixing smaller batches that can be sprayed out completely even if conditions change quickly. This allows you to rinse the tank and spray water through the boom, thus avoiding a contamination problem developing overnight. If that’s not possible, at least do not let a tank mix sit in the boom overnight. Instead, use your clean water tank to push water through the boom prior to storage and double check the screens. The following day, prime the boom with your tank mix as usual and resume spraying the crop. 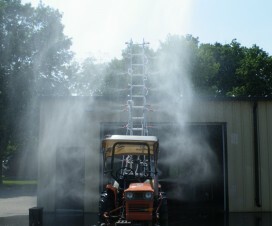 If you’re not sure that your sprayer can draw from the clean water tank and push through the booms (the wash-down nozzles are, after all, the intended destination for that water), decipher your system and add the necessary valves that make this possible. A useful design that helps flush and prime a boom quickly is the recirculating boom offered by some aftermarket boom manufacturers. These booms are also more common on European sprayers. A nice feature of such designs is that the tank contents can be pumped through the entire boom assembly without actually spraying. This ensures that the boom is primed without any soil contamination. It also dilutes whatever residue there may be in the boom plumbing with the entire tank, likely reducing its concentration enough to be of little concern. An additional feature of recirculating booms is that many offer stainless steel tubing throughout most of their feed and return length, minimizing the black rubber hose products that often adsorb, and later release, herbicide contamination. 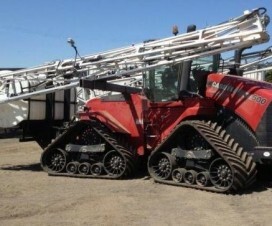 Even if a wholesale boom or sprayer change is impractical, consider switching to steel boom lines and tanks tank to minimize residue carryover. As is often the case in the spraying business, prevention is easier and less costly than solving a big problem later. Spray mix storage is one of those examples where a small amount of extra effort at the beginning can pay big dividends later. Pressure changes spray angles – a lot! How Fast Should I Drive My Sprayer?